Here in the Western Great Lakes region, many Kumlien's & Thayer's could be suspected of being one or the other. You see, the two have a suite of characteristics that can - and do - overlap in every possible respect. Of course this is not to say that there aren't any clear-cut Kumlien's or clear-cut Thayer's here. There are. But we also have many birds that take on a "range bias" when they're looked at by outsiders. 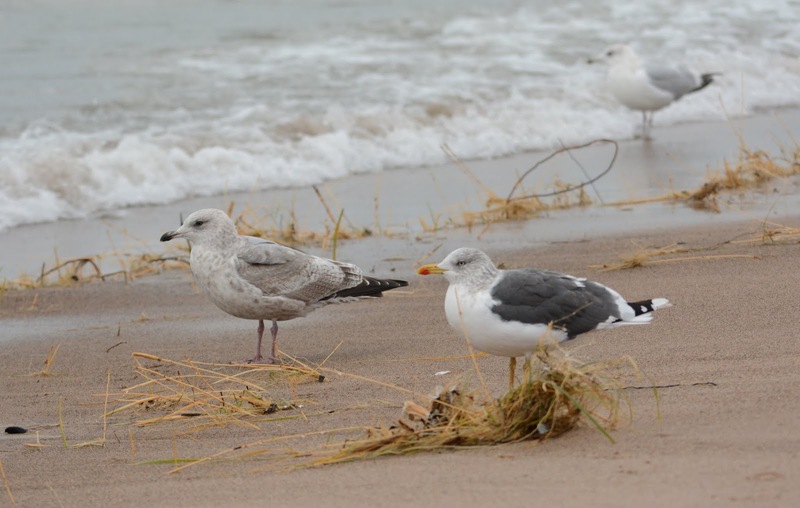 Thus, the majority of gull enthusiasts on Lake Superior and Lake Michigan are left having to make arbitrary identifications with some of these birds. Fortunately, 2nd cycles are not as difficult as 1st cycles and adults. Dark Kumlien's or pale Thayer's? Lake County, IL. 28 November 2014. I circulated the photos of this bird to several trusted gull aficionados from both regions of the continent (West and East coasts), and as expected, some birders from Colorado and areas to the west, identified it as a pale Thayer's, while birders from New York and east called it a Kumlien's. I favor the latter identification. Rather plain outer primaries and overall pallid upperparts seem fine for Kumlien's Gull. Thayer's Gull (2nd cycle). Santa Cruz, California. 17 January 2014. Thayer's Gull (2nd cycle). Lake County, Illinois. 31 January 2014. Notice how the tertials act as a color-bridge between the noticeably darker primaries and somewhat paler upperwing coverts. Kumlien's Gull (2nd cycle). Lake County, Illinois. 31 January 2014. Kumlien's Gull (2nd cycle). Niagara River. New York. 29 December 2012. Kumlien's Gull (2nd cycle). Toronto, Ontario. 27 December 2012. Overall solid dark tertails centers, but with lots of internal markings and stippled upperwing coverts. The primaries are not as dark as I'd like to see on a textbook Thayer's. Kumlien's Gull (2nd cycle). Toronto, Ontario. 27 December 2012. Very similar to the subject bird. The lack of contrast between the solid tertial centers and pale primaries is standard Kumlien's. Same bird pictured above. The outer primaries don't contrast much with the rest of the upperparts. Thayer's Gull (2nd cycle). Michigan City, Indiana. 27 November 2014. The outer 5-6 primaries are markedly darker than the rest of the flight feathers and upperwing. Thayer's Gull (2nd cycle with adult Lesser). Michigan City, Indiana. 28 November 2014. Although the tertials show pale outer halves, the bases have a solid brown color that's complemented by considerably dark brown primaries. The take-away from this post should be that 2nd cycle Kumlien's with solid tertial centers are not uncommon, and the key is not to look at this field mark in isolation (as is the case with any field mark). Always compare the tertials to the color intensity of the primaries, along with the overall color of the upperparts. I made my first visit of the season to the Lake County Fairgrounds on Saturday. I was happy to find the gulls comfortable and resting as they should be. I tallied 6 Thayer's Gulls for the day (3 adults, 1 fourth cycle type and 2 first cycles). Highlights were the 2 first cycles on opposite sides of the color spectrum - one dark individual and one light - which the title of this post is referring to. Thayer's Gull (1st cycle). Hampton Scale Score 28. Thayer's Gull (1st cycle). Hampton Scale Score 21. The lighter Thayer's falls squarely between a solid Kumlien's and Thayer's, and so it wouldn't be unreasonable to call this a Kumlien's/Thayer's type, or KT (for a review of these scores, click here). Although given the relatively dark outer primaries, along with the darker tertials and darker secondary bar, I'm leaning heavily towards Thayer's. Note the less advanced wingtip pattern. For instance, the mirror on P10 is faint and smaller than that on P9. Also seen is relatively extensive black streaking on the alula and outer greater primary coverts. The upper tail shows black markings and the upperparts are tainted with brown tones - both sub-adult features. The prebasic molt is finishing up with the inner secondaries and the outermost primary (still about 1" from fully grown). Possible LBBG. It's my hope that observers aren't looking the other way when they see these brown types with paler bill bases. I've learned that using the descriptions in field guides, and not allowing for variation at the species level, hampers one's ability to really get to know a species. Large gulls can not be contained by a field guide. Of all the species I see here in Northern Illinois, adult type LBBGs are always in heaviest, and latest, flight-feather molt. Even more interesting is that birds at this landfill, in particular, seem to be farther behind in their PB molts than those near the lakefront in Michigan City and New Buffalo (data is insignificant, based on 3 years of observations). Could it be that birds under higher demands of molt-stress resort to a more reliable and "convenient" food source, such as landfills? 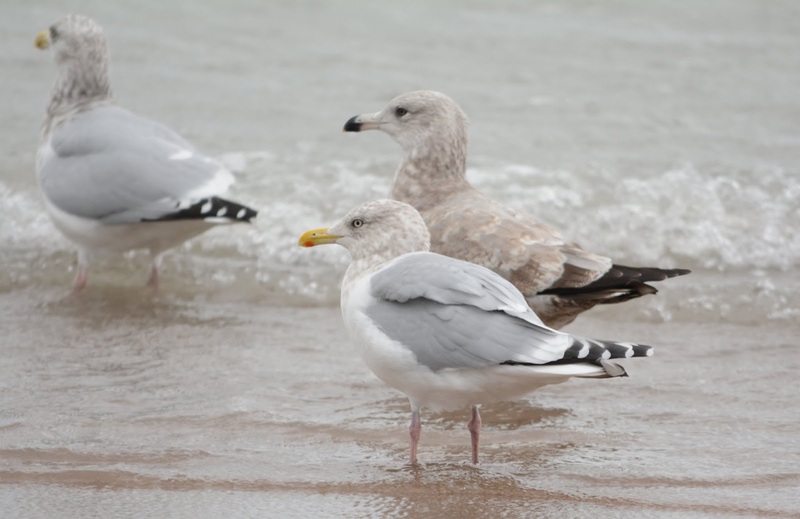 Whereas others with mostly grown flight feathers may be more inclined to fly out on Lake Michigan and keep to a more aquatic diet? A 1st cycle Herring with a paling iris. This is not something I often see. Same individual above. Herring Gull (1st cycle). Not uncommon is this bill color aberration found on 1st cycle HERGs. These darker brown Herrings appear to be more common out West. Birds this uniform likely originate from farther north (or away) from the general Great Lakes region. Many adult type HERGs are growing out their outermost primary right now which gives those birds with a larger mirror on P10 a thayeri feel. Couple that with the large, fresh, apicals and I had to stop to closely examine these birds a few times yesterday - especially on a couple that had darker, amber-brown eyes. Thayer's Gull (adult type). Outer two primaries still growing. The mostly black bill and white rounded head give it an interesting look. The pointed brown centers to the newly grown scapulars and long-winged look had me wondering if there was something else going on here. More to come on this bird in my next post! Herring Gull? Michigan City, IN. 08 Nov 2014. When I initially found this bird it was standing with a group of Herrings. I thought about it for a few seconds before letting it go in order to focus on a couple of black-backeds. All the while in the back of my mind, I was debating whether to call it a Thayer's or Herring. I'd occasionally look back at it while photographing the close-by Lessers and eventually walked over to it to investigate whether the wingtips were as "slaty" as they appeared from a distance - they were! There's no question that the wingtip coloration is paler than expected for a fresh set of Herring primaries. I couldn't put the orbital to use as it was mostly blackish-brown, and so that field mark did not support or contradict Thayer's, but the extremely pale-yellow eye is what pushed me away from Thayer's. Thayer's Gulls with eyes this pale are rather rare. In addition to that, the rest of the face and head gave me the impression of Herring (admittedly though, it could just be the "evil" stare that's reminiscent of HERG). I've second guessed myself on this bird's ID a couple of times now - Thayer's or Herring - and part of that might be because I expect so-called "Northern Herring" types to appear later in the season with larger bodies, bills, and in general, bulkier proportions. I also have trouble accepting this less-than-true-black wingtip for Herring. I'd like to think that if it is a Herring, there is a melanin deficiency at work or outside influence (Glacuous?). The former explanation is pure speculation, and it does present an identification nightmare with large gulls if we begin to attribute paler tones in wingtips to a lack of melanin, although it should not be entirely ruled out. The latter explanation with regards to hybridization doesn't sit well with me either - you'd think the upperparts would be a bit paler and the bill and head would be bigger. This individual was, structurally, okay for Thayer's and appeared a tad smaller than average for a Herring. New Buffalo, MI. 18 October 2014. Michigan City, IN. 08 November 2014. For my sanity's sake, I hope it's the same bird and that I've not found two pale white-winged Herrings in three weeks. This shade of black on the wingtips is really pushing the limits of what is within the range of a pure Herring Gull. I could live with leaving this bird in the "most-likely-a-Herring Gull" file for now, with the added footnote that the wingtips are unreasonably pale and problematic. My best bird of the day was the last bird of the day. I had already packed up, taken off my coat, gloves and hat and started to drive off. But before leaving the parking lot, I decided to do a quick binocular scan of the gulls resting across the river. Bingo! It took less than 5 seconds to pick out this Iceland. Adult Kumlien's Iceland Gull. New Buffalo, MI. 08 Nov 2014. That's great, I thought, but I like my gulls closer than that. It was no more than 2 minutes when out of nowhere came two guys on stand-up PWCs, flushing all of the gulls. Why they'd be out in such cold weather is beyond me (probably to take advantage of some of the high waves brought on by the northerly). I kept on the Kumlien's and watched it head over to the public beach. Showtime. This is one instance where I was glad to have a watercraft come by and "scare up" the birds. All dark eye and darker than average wingtips. P10 emerging with all white tip. P6-P9 with progressively dark markings. Inner secondaries and rectrices still molting. Now to rewind to earlier in the day. Before hitting New Buffalo, I spent a couple of hours on the beach at Michigan City. There was one wind surfer out, which to my advantage corralled all of the gulls to one side of the beachfront. I could see a couple of young Great Black-backeds from the car (they're pretty hard to miss) and so I was hopeful. LBBG (1st cycle), Herring (1st cycle), Herring (adult), GBBG (2nd cycle), Herring (2nd cycle). Just as the gulls began to take to me, they scared and scattered out over the lake. I knew the culprit had to be a dog or a raptor. I looked behind me to to find a Peregrine Falcon racing down the beach, nearly at eye-level. I started waving my hands and running in the falcon's direction. It abruptly made a u-turn and ascended back into the park. The gulls eventually returned and became unusually cooperative; Was it the handouts I was offering or me acting as an indirect shield that motivated them? In any case, I'm glad the Peregrine didn't call me on my bluff because he was definitely coming in for the steal. Shortly after I was joined by Mike Timmons who had perfect timing for the show. We watched a couple of LBBGs and GBBGs at a relatively close distance - my totals were 4 GBBGs (2 second cycles, 2 first cycles) and 2 LBBGs (2 first cycles). LBBG (1st cycle). A few replaced upper scapulars. LBBG (1st cycle). A slightly crisper and paler individual. GBBBG (1st cycle). Perhaps the "prettiest" 1st winter Great Black-backed I've seen here on Lake Michigan. EDIT: I MEANT TO COME BACK TO THIS BIRD. THANKS TO KEN BROCK FOR THE NUDGE. I AM LEANING TOWARDS A LESS-THAN-PURE GBBG, PERHAPS WITH SOME GLAUCOUS INFLUENCE - THE BROWNISH PRIMARIES WITH PALE EDGING AND OVERLY WHITE UPPERPARTS HAVE SWAYED ME IN THAT DIRECTION. ALSO OF INTEREST ARE THE POINTED, PALE, "DIAMOND" TIPS ON THE INNER PRIMARIES (SEEN ON THE OPEN WING), ALTHOUGH ADMITTEDLY, I'VE SEEN A SIMILAR PATTERN ON PURE GBBGS BEFORE. EDIT II: AFTER ACQUING THE OPINION OF NORWAY GULL ENTHUSIAST, NIGEL HELGE, I'M NOW BACK IN THE "PALE GBBG" CAMP WITH THIS BIRD. NIGEL HAS EXPRESSED TO ME THAT HE'S SEEN BIRDS THIS PALE BEFORE, AND THAT THERE IS NO WAY TO RULE OUT A JUVENILE THAT SIMPLY MOLTED INTO WHITISH 1ST BASIC FEATHERS. Same individual pictured above. Note the faint mirror on P10. So the season is off to a good start for both black-backed species, but a bit below average for Thayer's. I did have what I thought was a solid adult THGU, which I've decided is a mimic, white-winged, Herring. One of the trickiest Herrings I've encountered to date. See my next post on that bird!